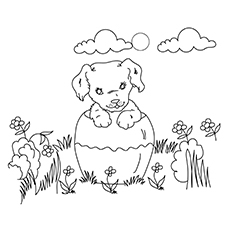 Tell your child to trace the letter with a crayon and then fill the colors. 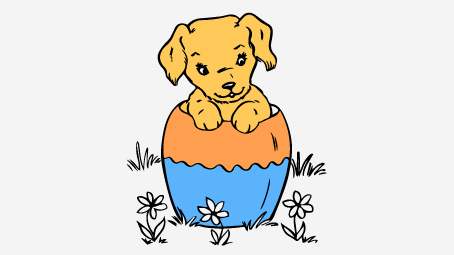 You can also ask your child to give this cute and tiny dog a name. 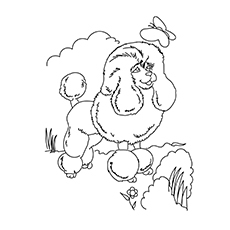 You can also print out this coloring sheet to create an alphabet coloring book. This will help your child remember the alphabets better. 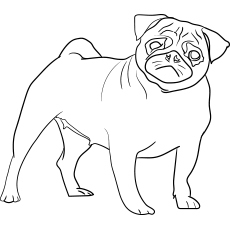 Pugs have short-muzzled face and curled tail. 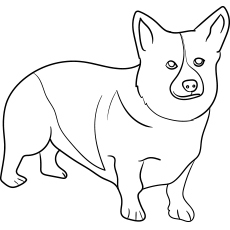 This small, lively dog originated in China. Their friendly nature makes them one of the favorite pets of kids. Pug has a fine, glossy coat and comes in a variety of colors. It has a compact, square body with well-developed muscles. 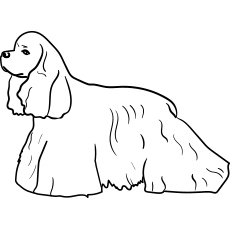 Poodle is a type of water dog originally bred in Germany. They are regarded as the second most intelligent dog breed after collie. They have moisture resistant furs, which make them excellent swimmers and retrievers. 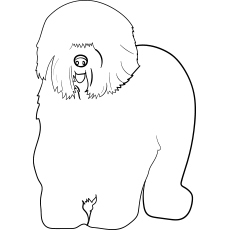 Poodles are also skilful in many kinds of dog sports like tracking and herding. German Shepherd, also known as Alsatian Wolf Dog is a large sized working dog that originated in Germany. They were originally trained to herd sheep, but were later included in search and rescue mission, police and military roles and even acting for their strength, intelligence and obedience. 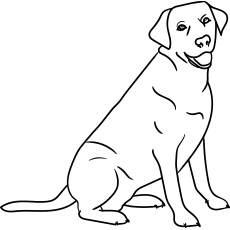 Their gentle and loyal nature makes the Labrador a great family dog. They are well behaved, even-tempered around young children and elderly. 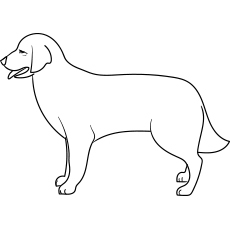 Labrador dogs have webbed paws, which make them great swimmers. In fact, they were originally bred to retrieve fishing nets. They are also trained to aid blind people and autism patients. 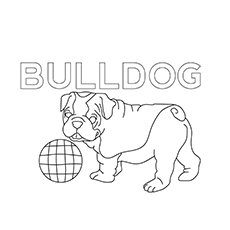 Bulldog is a heavy and muscular dog with a distinctive pushed-in nose and wrinkled face. They have thick folds of skin on their brow and wide-set eyes. It is the fifth most popular dog breeds in the world. Its disposition is equable, kind, resolute and courageous. Bulldogs get along well with children and other pets. They become so attached to their owners that they do not even venture out of the yard without its human companion. The Yorkshire Terrie, also known as Yorkie, is a small dog bred originally to catch rats in clothing mills. Yorkshire Terrier is renowned for their glossy, fine, silky and straight hair. They have a long coat that is parted down the middle of the back. Yorkshire Terrier has also been a part of the development of other breeds like Australian Silky Terrier. 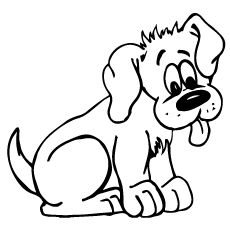 A beagle is a short dog with small ears and short legs. They have an even temper and friendly disposition, which make them a great household pet. They appear in a range of colors, although white with large black areas and light brown shading is the most common. Beagle dogs have a great sense of smell. In fact, they were originally bred for tracking hare, deer and rabbit. They are also employed as detection dogs. Siberian Husky is the oldest breeds of dogs. They are very energetic, agile and resilient breed of dogs. Siberian Husky is a medium-to-large-sized dog breed that originated in northeastern Siberia. 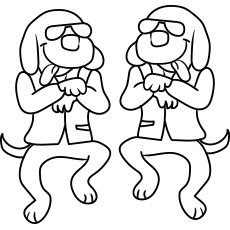 They are also known as the Eskimo’s dogs. 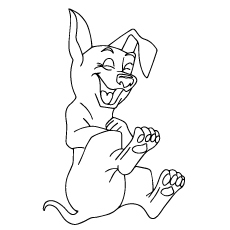 Do you know how this little dog got his funny name? This dog was named after the state of Chihuahua in Mexico. Share this fact with your kids as well. The Chihuahua is a small breed of dog with a loud bark. They come in a wide variety of colors, head shapes and coat lengths. It is a German breed of domesticated dog. They are known for their enormous size and great height. Kids love Great Danes for their friendly nature. These dogs are known to seek physical affection from their owners. 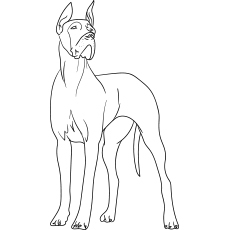 Doberman is an alert, loyal and intelligent breed of dog, making it suitable for companionship and family life. They are also used as police dogs and guard dogs for their determined and obedient temperament. These small and fluffy dogs are named after a region of Central Europe. 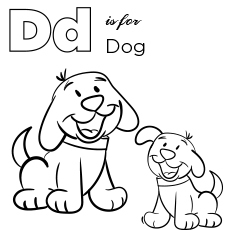 They are also known as toy dog for their small size. These compact yet sturdy dogs have an abundant, textured coat with a plumed tail. Cocker Spaniel was originally bred specifically to hunt woodcock, hence the name. Their small size and even temperament make them an ideal choice as pets. 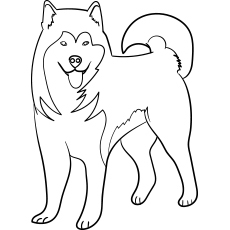 It is a medium sized dog with medium long and silky fur on the body and ears. 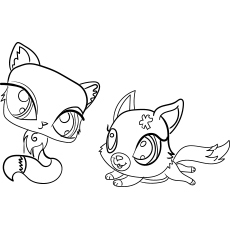 They have round eyes, shorter muzzle and a domed skull. Boxer was bred from the Old English Bulldog and Bullenbeisser. 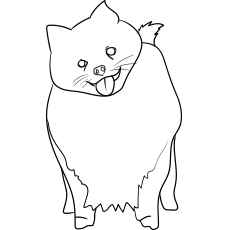 It is a medium sized, well-built dog with square jaws. It has a smooth coat, which covers the entire body. 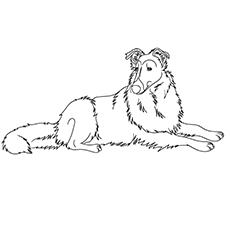 Collie dogs are known for their intelligence and agility. They are adept at following orders and herding large flocks of sheep. These smart dogs become distressed if they are not kept active and are not placed in a stimulating environment. This makes them excellent work dog and companion animals. 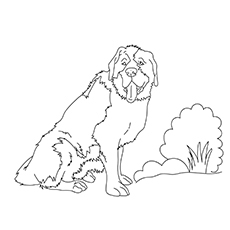 These dogs can be easily recognized by their thick and shaggy gray coat that covers the face and eyes. Its ears lie flat to the head. The color of the coat varies from gray to black to blue and white coat. This old European breed of dog makes an excellent pet. They are gentle, quiet and loyal to their owners. Their long legs, flexible spine and large heart allow them to run up to 40 miles per hour. Corgi has an athletic body with short leg. Its athletic body helps to herd livestock like sheep, cattle and poultry. Corgi dogs are extremely loyal family dogs. They live in a variety of settings from farms to apartments. Bernard is the strongest, biggest and fluffiest dogs in the world. Its coat is typically in red and white colors, but can sometimes be mahogany brindle with white with black shadings on the face and ear. 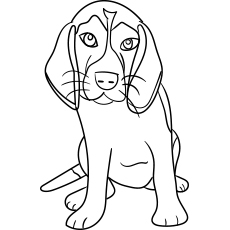 Bloodhound is famed for its ability to discern human odors even across water. Its extraordinary sense of smell combined with strong tracking instinct make it popular in the crime investigation department. 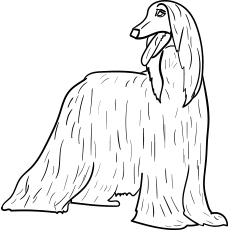 The dog is distinguished by its thick, silky and fine coat with a ring curl at the end. 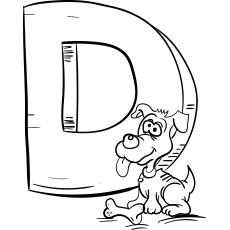 This breed of dog is not suitable for an enclosed living, as it needs regular exercise and physical activity to maintain its health and fitness. Its thick fur keeps it warm and dry in cold weather. 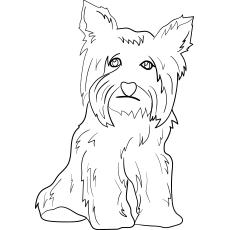 Schnauzer is usually black and white in color with a stiff and wiry hair coat. 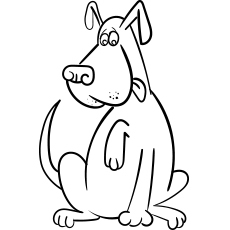 It is a heavy dog with a formidable structure and nature. Its ears are small and proportionate. 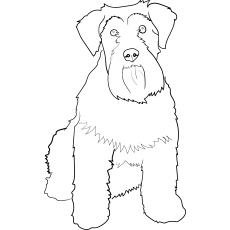 Schnauzer dogs are calmer and easier to train than other terrier types of dogs. This makes them excellent family pets. It is a robust, squarely built dog with aristocratic bearing. 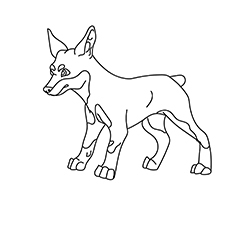 They are known for their agility, alertness, intelligence, strength and endurance.